They do so by trying to gratify as many as possible without causing harm to the others, says Shreekant Sambrani. The Pradhan Mantri Kisan Samman Nidhi scheme proposing to directly transfer Rs 6,000 per year in three instalments to all farm families holding up to two hectares of land is without a doubt the centre-piece of the interim Budget 2019-20. Even the former finance minister P Chidambaram labelled it the "Big promise". This transfer is in reality a top-up, and not any variant of the much-discussed universal basic income. It is not universal at all. And it falls well short of the extent of deprivation of the poor as measured by any accepted yardstick. Political opponents (read Congress) and some economists have critiqued it on this ground. 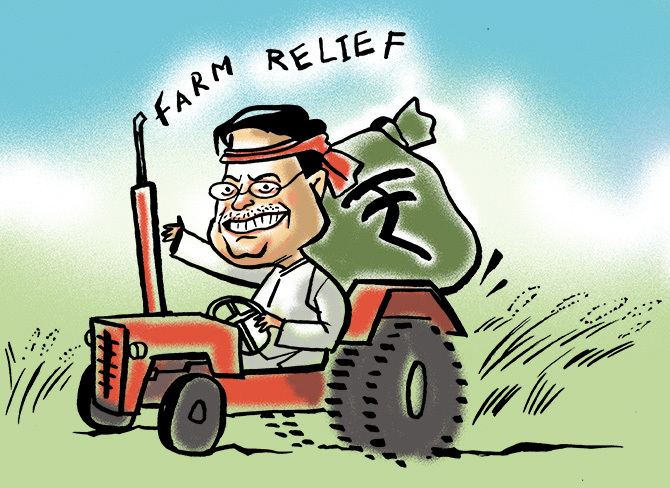 Mr Chidambaram has joined the chorus led by his party president Rahul Gandhi by asking a rhetorical question: "Will Rs 17 per family per day alleviate the distress or poverty of a farmer-household?" Others have shown their mastery of the calculator by terming it Rs 3.30 per person per day. Why not carry this exercise to its reductio ad absurdum next level, which is 14 paise per person per hour? Surely someone of Mr Chidambaram's financial acumen ought to know that certain expenditures of even a dirt-poor household, such as treatment of illness, repairs to the shelter, or marriage in the family, have indivisibilities. Formal credit does not cover these eventualities. Recourse to the local sahukar becomes inevitable when such needs arise. A lump sum grant of Rs 2,000 every four months may not be much, but it could well help beneficiary households keep the wolf of predatory private borrowing at bay for a bit. That is not an insubstantial relief. Many have also argued that the transfer is small in comparison to the costs of farm inputs -- fertilisers, irrigation, fuel, among others. Yet the stark reality is that a large majority of the 120 million target households practice virtually dry cultivation, with little or no input use. That leads to poor productivity and continuing distress. That agriculture needs reforms is not in dispute, but what sort of reforms are called for? Ashok Gulati pleads for major marketing reforms. But how many of the small and marginal farmers enter the market? And can those few that do withstand the enormous asymmetry of market power between sellers and buyers? I have long argued that what matters to farmers is not the price they receive per se but the income they earn. The root cause of rural distress, as I have argued previously, is that these 120 million small and marginal holdings support an impossibly large number of people, as employers of the last resort. There appears to be little hope of anything but an insignificant proportion of these atomistic units, forever subdividing in amoeba-like fashion, could ever become viable. Some sort of collective decision-making could help, but that too is evident only in extremely small number of cases. Seed multiplication farmers in a village act together, but only because the seed companies hold the threat of rejecting the entire group even if one member deviates from the prescribed practices. This is also the case when speciality marketers such as Fairtrade Label Organisation demand group discipline and adherence to stipulated norms. Elsewhere, in the overwhelming majority of holdings, each cultivator is law unto himself. When even a minor adverse event affects agriculture, farmers immediately plead for government intervention. Small cultivators in Madhya Pradesh are now angry at the new state government for not helping them, after having voted out the previous one for the same sin. This indicates the depth of the farmers' ingrained need of a mai-baap sarkar intervening at all times. A popular Hindi film song from the 1960s goes, Jab pyar hua is pinjare se, tum kehane lage aazad raho (the confined bird that has come to love its cage is not ready for freedom). Breaking up subsistence Indian agriculture from government is hard to do. They do so by trying to gratify as many as possible without causing harm to the others. Greater giveaways add to the expenditure necessitating additional deficit, which in turn is a cause of alarm as it triggers inflation, hurting everyone. With the interim Budget, the government seems to have walked a very tight rope, of balancing the available (stretched) resources and the goal of maximising possible beneficiaries. That might be worth a muted cheer. Shreekant Sambrani is an economist.